Torture! What Is It Good For? Absolutely Nothing… Ever. 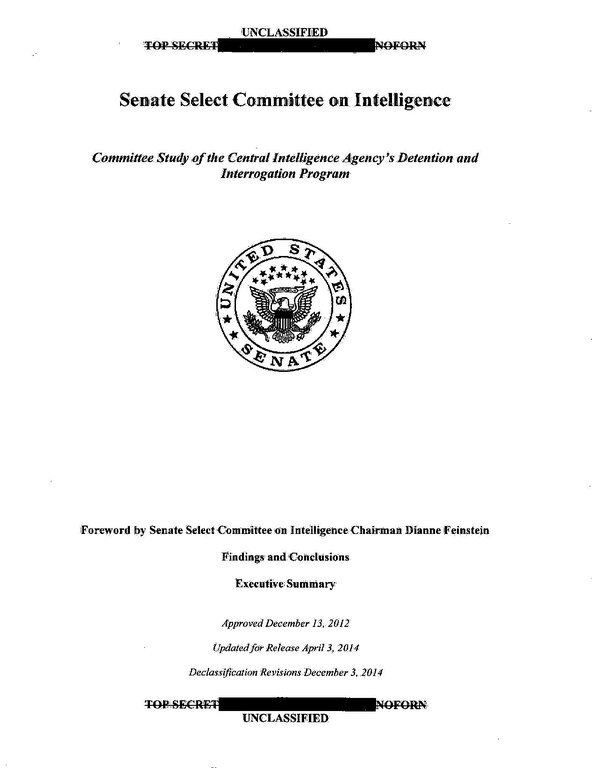 The recent declassification of the US Senate Committee Report on the Central Intelligence Agency’s use of torture on detainees has (rightly) provoked public outcry – both against the use of Enhanced Interrogation Techniques (EITs) that amounted to torture, as well as backlash from the former Bush 43 administration over perceived flaws and misapprehended findings within the report. Those denouncing the report also believe declassification occurred as a result of the politicisation and demonization of the Republican Party, the CIA and the efforts of the US Armed Forces to combat terrorism over the last decade and a half. However, there is a middle ground here where arguments have been made out by the public and certain government and intelligence actors that surreptitiously suggests that torture may be illegal and ugly, but given the shocking brutality of groups like al-Qaeda and Islamic State may morally and/or ethically warrant a moderate employ of torture (such as waterboarding aka simulated drowning), particularly when it results in actionable intel that ‘saves American lives’. Even more worrisome is the perception that such arguments are both intellectually brave and perfectly reasonable. One accepts that we are in the midst of troubling and uncertain times. But in making such acceptance, one must outright reject the notion that somehow criminal acts such as torture are not absolutely internationally prohibited by law. There are few internationally criminal acts that rise to this level, including (but not limited to) genocide, war crimes, and crimes against humanity (wherein torture itself is a modality of the crime). Furthermore, the notably absent comment from Bush 43 on the outcome of this report is not, as some pundits portray it, a mystery. Even Cheney should consider his public comments carefully. Taking a cue from the Pinochet extradition cases in UK for crimes committed in Chile during his military dictatorship, the absence of any domestic prosecutions for torture may lead to international indictments against the offending administration where it is clear that these acts were part of a systematic and executively-approved mandate. That terrorism provides a contextual narrative behind the impetus for such coercive techniques is both legally and morally bereft of evidential value. It is also a criminal act for which countries are legally required under international law to pursue prosecutions against domestic perpetrators or extradite to another state that is willing to do so (a principle in international law known as aut dedere aut judicare). The international prohibition on torture is both absolute and non-derogable (arguably jus cogens in nature), meaning under no circumstances may it be acceptable as a means of obtaining information – whether or not the information obtained is reliable. And that is what is most disturbing about this: There is a not-so-tacit permissiveness in the report’s critics, where information gathered under torture is reliable, actionable and can point to intelligence and security successes (particularly in so-called ‘ticking bomb’ scenarios of an imminent security threat), that any country can wash their hands of the moral indignity of using torture is tantamount to criminal hypocrisy of the highest order. Most reasonable individuals are aware of the challenges that such a restrictive policy places before the security services (re-read the Israeli Supreme Court’s comments). Theirs is not by any means an easy profession. However, in defending and securing the future of any state, the best and most reliable source of unrelenting loyalty to that state comes from the unshakable and genuine belief that it is a state worth preserving. All states have moral and ethical issues, but it is those fundamental legal principles of that state that give real meaning to both the moral and legal character of its citizens and its representatives. It is submitted that the adherence to the strict and absolute prohibition on the employment of physical and mental torture is one of those fundamental principles and to abandon such would be an act of irreversible self-harm. Lastly, sparing some criticism for those involved in the creation of international law: The Convention against Torture and Other Cruel, Inhuman or Degrading Treatment or Punishment (1984) definition of torture (Article 1) is ‘purposefully vague’. That is to say, rather than enumerating a list of prohibited acts as torture (which invariably leads to arguments that omitted acts are less than torture and thus acceptable), the definition focuses on (a) the intentional infliction of severe pain or suffering, whether physical or mental, (b) for such purposes as coercively obtaining information or confession from the subject or a third-party, and (c) where such acts were inflicted, instigated, consented to or in acquiescence of a public official or person acting in official capacity. The problem here is that even this definition is open to each state’s interpretation as to what ‘severe pain or suffering’ means (i.e., if moderately painful, it may not be torture). It is here in this darkest of grey areas where the law does not offer the protections that the public may incorrectly assume that it does. That is on us as international lawyers for not having the wherewithal to address the matter more robustly – something for which victims of torture-by-another-name may find unforgivable.